There’s not a lot to say about a beach holiday really. 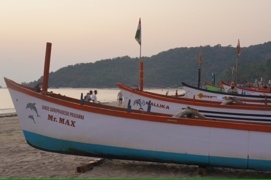 In the sun, on the sand, in and out of the surf… I was only in Goa long enough to get a brief taste of what this south western state has to offer, but it’s already on my list of places to return to…. My arrival is dramatic – we are about to land, low enough to see into the backyards of the houses we are flying over, when, without warning, the engines roar and the plane pulls sharply upwards. I can only assume that the pilot wanted us to get excited about arriving in Goa, and by the time we eventually land (with no explanation beyond a laconic “we’re going to try that one again”), the passengers break into spontaneous applause. A driver is waiting to meet me for the 1 1/2 hour trip south to Palolem, through a lush green landscape of bananas, rice paddies and coconut palms. One of the first things I notice is the set of rosary beads hanging from the mirror, and that the usual figure of Ganesha or another Hindu deity attached to the dashboard had been replaced by a crucifix. Soaring painted plaster churches popped up regularly along the road, reminding me of the Pacific Island churches at home in Manukau. My driver tells me that masses start as early as 5:30am, so that they can fit in three full rounds by ten. Such is the legacy of Portuguese colonisation. Arriving in Palolem, we turn down a sandy track, dodging some wiry black pigs who come snuffling out from behind a palm tree. Walking down a narrow lane we reach Ciaran’s beach huts – though they’re rather more fancy than the shacks I was expecting, given that they are taken down and rebuilt after each monsoon. 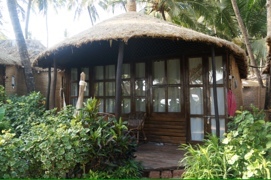 A hammock swings from the verandah in front of my hut, and double wooden doors open to reveal a large circular bed draped with a mosquito net, attached to a coconut palm which is growing up through the roof. A tiny bathroom is tacked on behind, and shelves are hung from the walls by thick coir twine. 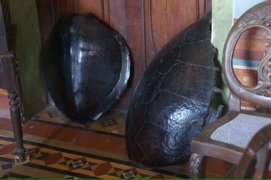 The walls themselves are coconut fibre, the slate floor laid directly over sand. In front of the circle of huts is a lawn fringed by hibiscus and bougainvillea, and open sided pavilions provide shade for a restaurant, bar, and a tiny library. 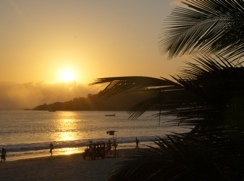 Immediately beyond is the beach, a long stretch of golden sand, lined with beach huts, restaurants and small shops. A life guard perches atop a small tower, and wooden outrigger fishing boats make a colourful line-up along the beach. English tourists predominate – in the bar at the northern tip of the beach I meet a guy who has been coming here for ten years, and another couple who rebooked for this year as soon as they returned from last year’s visit. Along the main shopping street are row after row of open fronted shops selling jewellery, spices, jandals and various forms of hippie muslin dresses and pants (trousers, for my English friends). I’ve managed to lose my sleep sheet, so I spend a while hunting down a cheap cotton bedspread, then finding a tailor to sew two sides into a makeshift cocoon, for future use in less illustrious accommodation. 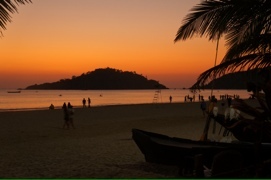 Then there is just enough time for a beer and a fish curry while watching the sun set over the water, before sinking into bed and falling asleep to the sound of waves crashing on the beach. Bliss. Unfortunately, the cold which has been threatening ever since I gingerly handed my passport to a sniffling receptionist in Aurangabad has finally kicked in, and I spend much of the next couple of days ensconced on the verandah drinking fresh lime sodas, with the occasional swim for medicinal purposes. After a day or two of this I am desperate for movement, so arrange for a car (INR2600 for the day) and set off to explore a little of the interior. I ask the driver to stop at a pharmacy, and he pulls over in a tiny village with two small shops, one of which says “medical”. The girls inside speak no English, so a pantomime ensues (with the questionable help of a Hindi phrasebook – the local language is Konkani), and eventually I emerge with a sheet of ten pills, at least three of the ingredients of which are recognisable, for the princely sum of INR20 (about 40 cents). 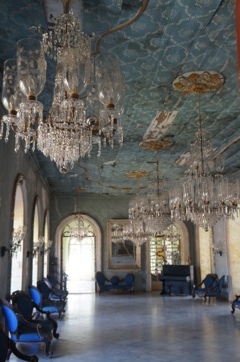 Goa is full of mouldering old Portuguese-style houses, and some of these are very grand indeed. The most well-known is the old Braganza house, built in the 1600s by a wealthy land-owning family, and in its day a truly stately home, and the family equivalent to local aristocracy. The land was confiscated by the Indian government after independence, and the house is slowly declining into squalor, relying on donations from visitors to fund repairs. Three other tourists arrive as we pull up, and we ascend the staircase together, to be greeted by a small man with a large tummy and thick glasses. 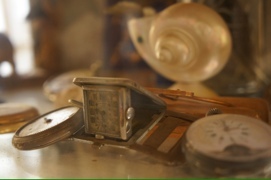 He shows us around one wing, through the drawing room with its chandeliers and sagging ceiling, then pauses significantly at the family chapel, and asks us to gather around to see the item in pride of place, a relic of St Francis Xavier, who died here in Goa. He seems pleased when I ask how the family came by this treasure: “Not many people know this”. It seems that the body of St Francis was, until recently, put on public display for veneration at regular intervals. After one such interval a family member was assisting to clean the tomb, when he came across one of St Francis’s fingernails, which now takes pride of place on the altar. Stepping into the house already feels like stepping into another era, but this is reinforced by the attitude of its caretakers. The other wing of the house is in better repair, and is presided over by a stern Indian woman who chivvys us along and makes sure that we are paying appropriate attention and looking sufficiently impressed as she shows us Ming vases and carved wooden chairs “identical to the ones used by Her Majesty Queen Elizabeth in Buckingham Palace”, as well as other local treasures, including the shells of two unfortunate sea turtles. The fresh air outside is welcome, and for a complete change of scenery I decide to head to a spice farm – this is the Malabar coast, after all! The staff at Sahakari spice farms greet you with a smile, a tilak (coloured powder applied to the forehead) and a garland of flowers around the neck. After a glass of lemongrass and ginger tea, we wander past a group of young girls in colourful saris singing a folk song and dancing in a circle (just until we are out of sight, when they go back to sitting around and waiting for the next bunch of tourists). 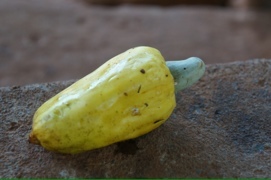 Our guide takes us through 2 acres of demonstration crops, each of which are grown in greater quantity on the farm – coffee, chocolate, cardamom, cinnamon bark, pepper, turmeric, and little pepper-like pods, the stems of which are the cashew nut. As we round a corner, we are forced to step aside for an elephant – my first in India! 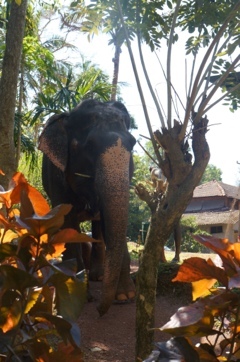 She is here only for the tourists – for a few extra rupees you can ride on her back into the river, where (on command from the mahout) she will raise her trunk and douse you with water. At the end of the tour we are served lunch and gifted a small pack of spices (not sure if they’ll get through customs, they may need to be abandoned). Time to drive back to the beach for another stunning sunset. Another beauty Nat. I did not know that about the cashew nut. Is the pod edible too?